Enjoying music–whether at parties and other events or at home–can lead to improved mood, cognitive performance, and memory functions for those with dementia. And singing or dancing along, rather than passively listening to music, can bring even greater rewards. Click here for an amazing video showing the transformation music can bring about! A recent study published in the Journal of the American Geriatrics Society found that for those with Alzheimer’s and other dementia, singing classic hit songs and show tunes for just four months allowed them to more easily recall memories and emotions and they experienced enhanced mental performance. Lead author of the study Linda Maguire explained the reasoning for these amazing results: Musical aptitude and music appreciation are two of the last remaining abilities in patients with Alzheimer’s disease. 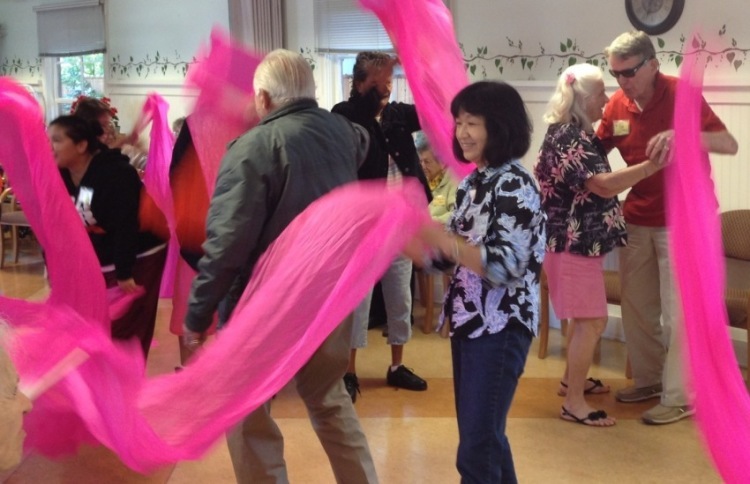 Music can evoke emotion in even the most advanced of Alzheimer’s patients. Neurologist Oliver Sacks says, “Music evokes emotion, and emotion can bring with it memory… it brings back the feeling of life when nothing else can.” By pairing music with everyday activities, patients can develop a rhythm that helps them to recall the memory of that activity, improving cognitive ability over time. As Linda Maguire says above, “Musical aptitude and music appreciation are two of the last remaining abilities in patients with Alzheimer’s disease.” Because these two abilities remain long after other abilities have passed, music is an excellent way to reach beyond the disease to the person. In the later stages of dementia, patients often lose the ability to share emotions with caregivers. Music and movement with a partner or other loved one can lead to hugs, kisses and touching, bringing feelings of security and happy memories. The singing sessions in the study engaged more than just the brain and the area related to singing. As singing activated the left side of the brain, listening to music sparked activity in the right, and watching the class activated visual areas of the brain. With so much of the brain being stimulated, the patients were exercising more mind power than usual. The Alzheimer’s Foundation of America says, “When used appropriately, music can shift mood, manage stress-induced agitation, stimulate positive interactions, facilitate cognitive function and coordinate motor movements.” This is because music requires little to no mental processing, so singing does not require the cognitive function that is lacking in most dementia patients. Alzheimer’s Foundation of America advises that songs from a dementia-sufferer’s young adult years—18 to 25—are most likely to elicit a positive response. Loading music from your loved ones’ youth onto an iPod or other digital listening device with headphones is an easy way to provide them these therapeutic and enjoyable benefits. Singing favorite songs together is an ideal activity for reinforcing positive memories and feelings of comfort and security. So play it again, Sam! Information taken from Alzheimers.net, an online community dedicated to advocacy, education and supporting those whose lives have been impacted by Alzheimer’s disease and other forms of dementia.